As you read this edition of the IAM Journal, I hope you will appreciate the new direction we have taken with it, and the increased emphasis we have placed on our members. You will read about organizing successes and how the Machinists Union has brought our jobs home from overseas. You’ll meet a few of our members who have served in our nation’s military, and you’ll be introduced to IAM retirees who defy age. Many of the photographs throughout the magazine were taken by one of our lobstermen members. Once you see his work, you’ll understand why he has gained national recognition. Please enjoy the stories and images included in the following pages of our IAM Journal. We are the Fighting Machinists. 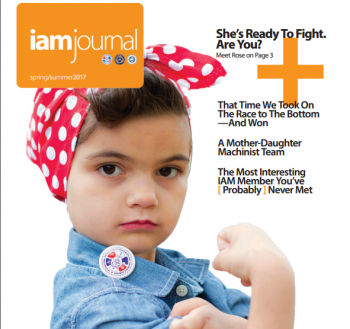 The post 2017 IAM Journal – She’s Ready To Fight. Are You? appeared first on IAMAW. Next meeting Wednesday May 2nd.